Stagecraft: Lighting design by Christopher Akerlind; Costuming by Robert Morga;, Projection designed by Zachary G. Borovay; Scenic design by Derek McLane. Most notable for his innovative way of devising the painting technique known as pointillism, French artist Georges Seurat was a major Post-Impressionist figure. By the time he died at age 31, he had created over 200 paintings and 180 works on paper. None of his paintings were more iconic than the large-scale A Sunday Afternoon on the Island of La Grande Jatte (painted 1884–1886). This painting was/is the inspiration for Stephen Sondheim and James Lapine’s Pulitzer Prize winning musical Sunday in the Park with George now lyrically and beautifully visual playing at the BU Theatre at the Huntington Theatre Company. When one approaches the large painting at the Chicago Art Institute, a sense of charm exudes from the visual experience. Similarly, this production evokes both musical and visual charm. It is a theatrical experience that embraces our senses, makes us think and simply gives us pleasure. The show is a complex story of art and life, class and consciousness as well as creativity and technology. The first act set in 1884 centers around a fictionalized Seurat immersed in his work in an obsessively single-minded way at the expense of his humanity. The fictional character is called Georges, and he is magnetically played as if he suffered from a form of Asperger’s by Adam Chanler-Berat. His facial expressions and body gestures need few or no words to splendidly characterize the totally obsessed, isolated and emotionally unavailable yet gifted creative artist. Georges is inspired by science, and in his art he wishes to express that. Pure colors are placed in dots or points next to each other to optically obtain shading, shadow and nuance. He is fixated upon harmony. The first act lays out Georges as an artist, son and lover. Seemingly focused entirely on his art, his character makes his familial and love connections awkward to illogical. His mother (played most ingratiatingly as well as sarcastically by Bobbi Steinbach) is at best a difficult acquaintance for him while his headstrong mistress/model Dot (played with a star-turn by Jenni Barber) is a problematic distraction. Yes, Dot’s name is amusing considering how Seurat painted. Yet, she is portrayed as his anti-muse. Georges mother is critical of a major tower being built in Central Paris and Georges as well. Dot eventually informs the artist that she is pregnant by him. This does not go over well. The seemingly tranquil park and Seurat’s studio are the main settings for the narrative. Both abstractly work brilliantly, stunningly animated at times with the large cast forming the famous Seurat representational paintings. 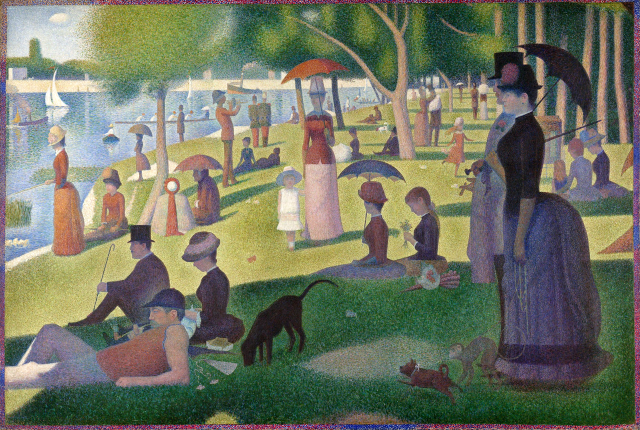 The cast includes portrayals of park visitors, two soldiers, a boatman, swimmers and another more conventional artist (who is highly critical of Seurat’s painting) his fawning wife, as well as a couple of quite boorish rich Americans visiting Paris. Georges however just keeps on painting and sketching. Throughout the show, Seurat’s aesthetic thesis of “Tension, Order, Design, Balance and harmony” are applied to the performances, stagecraft and melodies in creative and artistic ways. From the passing conversations of the various park visitors, we view a cross-section of the entire social spectrum of 1880s French/Parisian society. These underscore the notion of high art and everyday culture . A wonderful visual vignette takes place. A group of rowdy swimmers seems to overwhelm the serenity of the park. 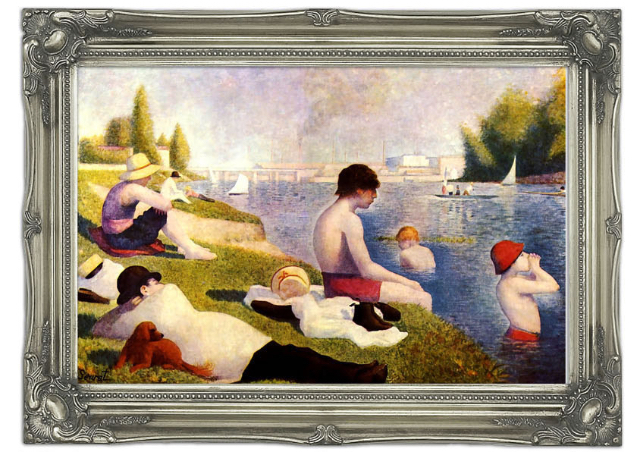 The group becomes a stunning living tableau of Seurat’s second most famous painting, Bathers at Asnières. Due to Seurat’s emotional and perhaps physical neglect, eventually, Dot finds another lover, a skilled baker, to marry her despite her condition. They move to America at the request of the American couple. Dot is the fulcrum of the play’s story and a beautiful, even radiant down-to-earth counterpoint to Georges rather grey ethereal presence. The second act shifts to the 1984 American artworld focused on a descendent George (great grandson) as a cutting edge techno-artist who creates technologically light-involved pieces. In this art, actual original content is overwhelmed by technology. Great grandson George is again played by a much more loquacious Chanler-Berat. Here art has become seemingly industrial rather than scientific. And importantly, the artwork is underscored and magnified or diminished by the artist’s own personality, not his craft or artistic skill. This descendent George’s 20th Century art technique is named “chromalume.” This is based upon Georges Seurat’s concept of chromoluminarism. George is focused primarily on light while his ancestor looked at light as well as color. It is a projection system that generates a programmed light show. Monotonously, versions of the same piece he presents to various museum audiences. As part of one of his presentations, he asks his grandmother to assist him. She references his great grandmother. The work presented uses George’s great grandfather’s A Sunday Afternoon on the Island of La Grande Jatte as a starting point for his visual interpretation. It consists of flashing shapes and colors, simplified geometric elements and a soundtrack. However, it has little soul. It is technology over artistic statement. In the end, George summons his inner creativity to move on. Though the leads Georges/George by Adam Chanler-Berat and Dot/Marie played exquisitely by Jenni Barber are sensational, other performers are also terrific including the previously mentioned Bobbi Steinbach, Seurat’s mother’s nurse by Amy Barker, Patrick Varner’s Franz, famed painter Jules by Josh Breckenridge, Melody Butiu’s Frieda, Jules’ wife Yvonne by Aimee Doherty and the young daughter named Louise played by Bailey MacNeal. With an elegantly realized sensitive flair for Sondheim and Lapine’s work, this production is superbly directed by the Huntington’s Artistic Director Peter DuBois. His lite touch of rich material belies the three plus decades old material’s age. The visual vignettes of the show are done as costumed ballet sequences that the performers gracefully dance with ease. This Huntington Theatre show is a wonderful, melodic and visually compelling musical production. Here Sondheim’s exquisite melodies are simply Sondheim at his most entertaining. This is truly a theatrical treat.